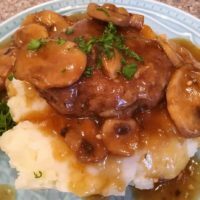 Instant Pot Salisbury Steak is my very first Instant Pot Recipe for the blog! 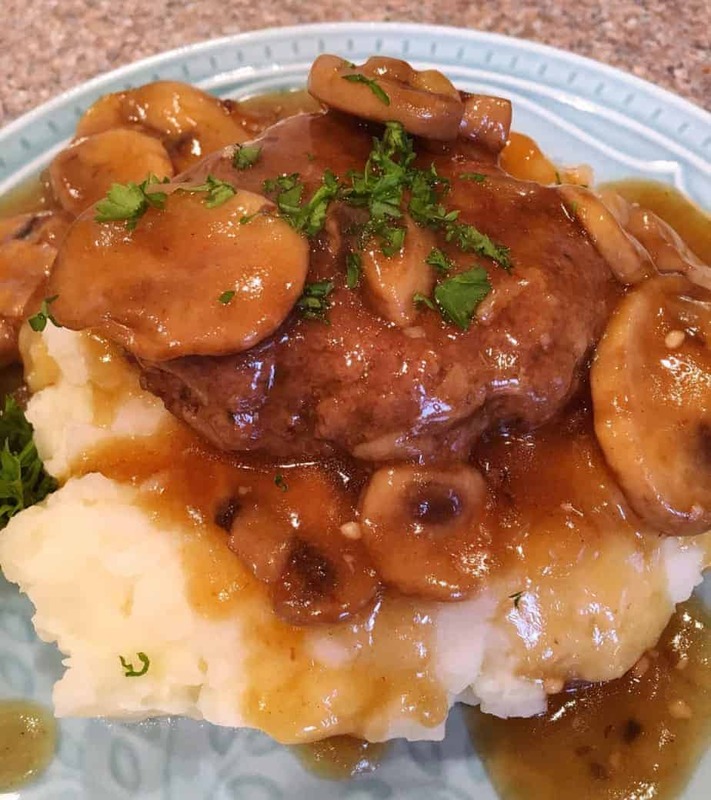 Thick seasoned ground beef steak patties with a savory mushroom, garlic, and onion brown gravy served over mashed potatoes. It’s quick, easy, and a dish your family will L.O.V.E. Can you believe it? 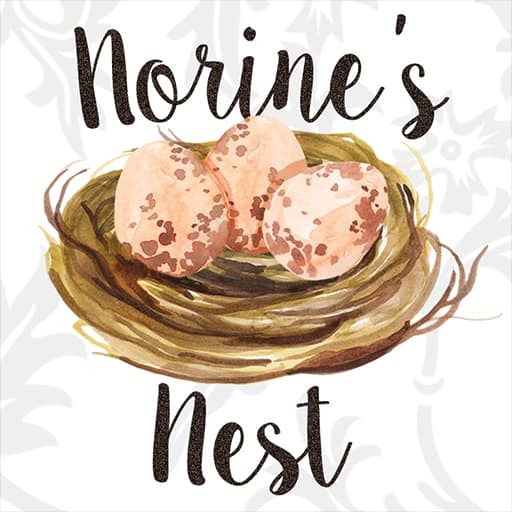 An Instant Pot recipe right here on Norine’s Nest! I’m ALWAYS late to the party! Without fail…I’m the last one to jump on the band wagon…and it doesn’t matter what band is playing…I’m gonna be the last one to hop aboard! What can I say? I’m not big on change! It’s a multi-functional cooking device. It can slow cook, saute, simmer, bake cake, and more. I’m highly impressed with all the safety precautions Instant Pot has put in place. It’s worth every penny you spent, just for the way it perfectly cooks hard-boiled eggs! HOLY COW!!! It cleans up easily and is easy to use. It can sanitize toys, baby bottles, etc. Big bonus for mom’s with little’s! The instructions are very straight forward and easy to follow. Be sure to READ all your operation manuals before using your Instant Pot for the first time. Once you understand the concept behind “pressure” cooking it’s an easy cooking appliance to use. SUPER EASY! So now that I’ve addressed my new love affair with the Instant Pot…let’s get cooking! 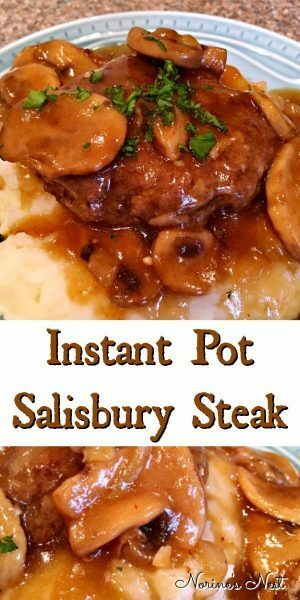 This is a great FIRST recipe if you’ve never used your Instant Pot. In a large bowl mix together 1 pound ground beef, 1/4 cup Italian bread crumbs, 1 Tablespoon dry Onion soup mix, 1/4 tsp black pepper, 1/4 tsp. 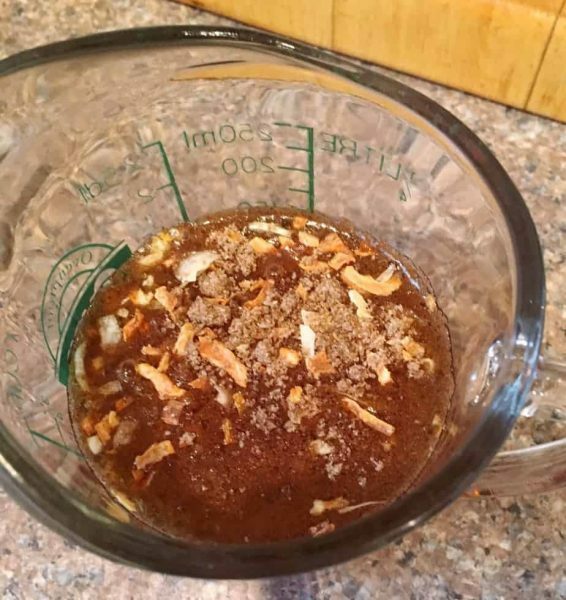 onion powder, 1/4 tsp garlic salt, and 1/2 Tablespoon Worcestershire sauce. Dig in there with your hands and mix it all together. Okay if you don’t like touching raw hamburger…man up! lol No I’m just kidding. I get it. You can mix it together with a heavy-duty spoon. Either way just make sure everything is well combined. We want those seasonings equally distributed. Divide the mixture into 4 equal portions. Form patties that are about 3/4 and inch thick and 4 inches long. I made my slightly oval in shape. TIP: Prepare all your ingredients before hand when cooking with an Instant Pot. It will help make everything go smoothly. In the bottom of your Instant Pot add 2 Tablespoons Olive Oil. Set your Instant Pot to Sauté and the heat selection to “more”. 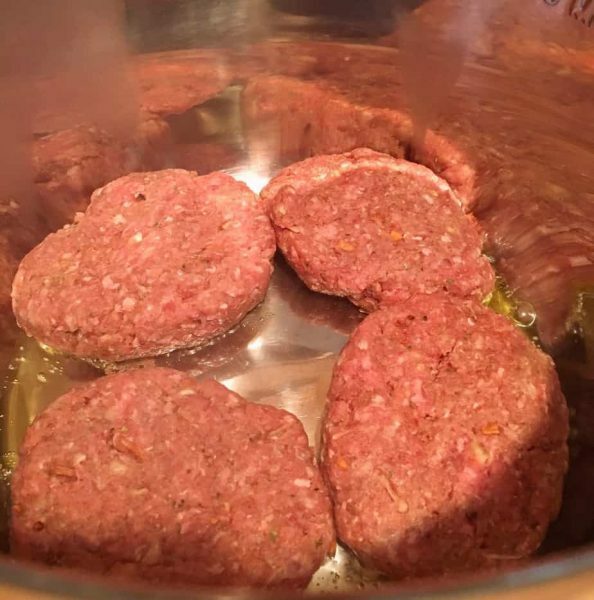 When the pots beeps, and indicates that it is “hot”, add your beef patties. Brown steak patties quickly making sure to brown both sides. 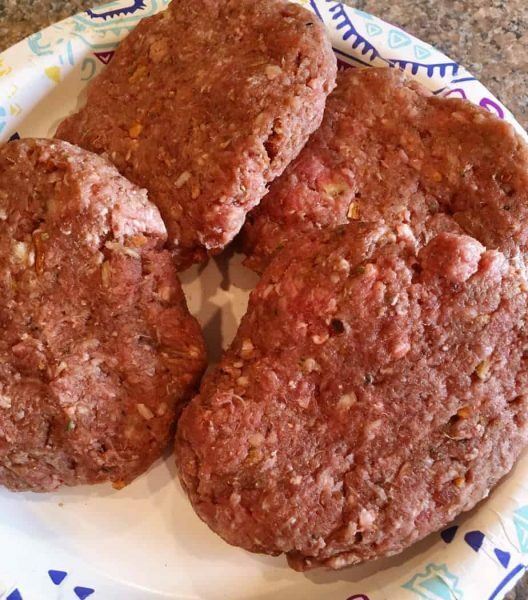 DO NOT COOK the meat patty all the way through. This is just a quick sear to get a beautiful golden brown color on the outside of the Salisbury Steak. 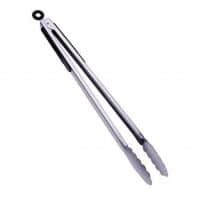 TIP: A pair of LONG handled tongs comes in handy to reach down into the pot to remove and add items you are cooking. Remove cooked patties and set aside. Add 1/2 cup diced onion, 2 minced cloves of garlic, and 2 cups of fresh sliced mushrooms. Sauté quickly until semi-tender and onions are translucent. In a measuring cup add 1 cup beef broth and 1 Tablespoon dry onion soup mix. This is the base for your brown gravy and are the liquids necessary to “pressure cook” the meat. TIP: Liquids create steam and build up the pressure necessary for your Instant Pot to work! Add beef broth mixture over sautéed mushrooms and onions. 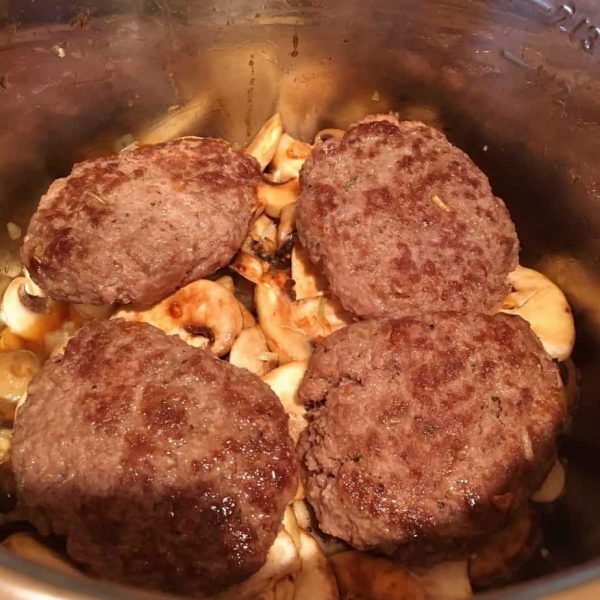 Place seared steak patties on top of mushrooms and onions. 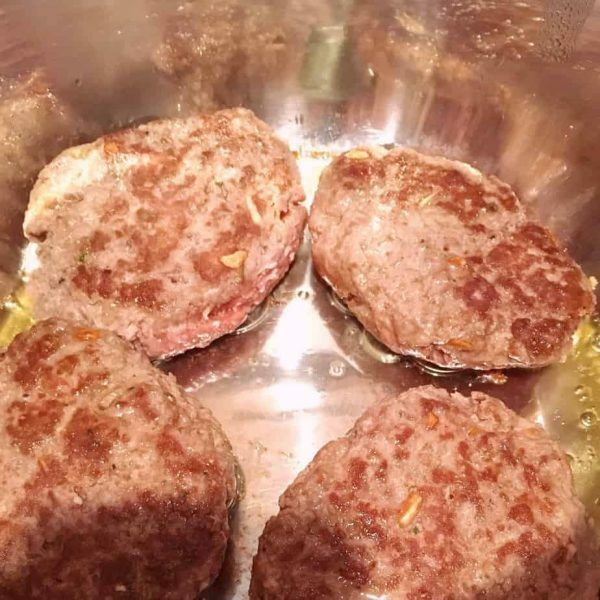 TIP: If you are doubling this recipe…just lay the additional patties on top of the first layer. It will be fine! Place lid on top of Instant Pot making sure it is in the “sealed” position and locked into place. Use the “meat/stew” setting, normal heat temp, and adjust the cook time to 6 minutes. While the meat is cooking and the pressure is “natural” released… prepare the mashed potatoes. Be sure the safety valve has receded before removing he lid. If it has not do a “quick release” to make sure all the pressure is gone from the pot BEFORE removing the lid. Place the “steaks” on a separate plate, cover to keep warm. Clear the settings and select “Sauté/More”. Bring broth, mushrooms, and onions to a simmer. In a small measure cup mix together 3 Tablespoons corn starch with 1/2 cup of water. Slowly add the corn starch mixture while stirring the broth in the Instant Pot. Continue to stir until broth changes from milky to clear and is thick. Salt and Pepper to taste. Be sure to carefully do a taste test first. No one likes bland gravy. 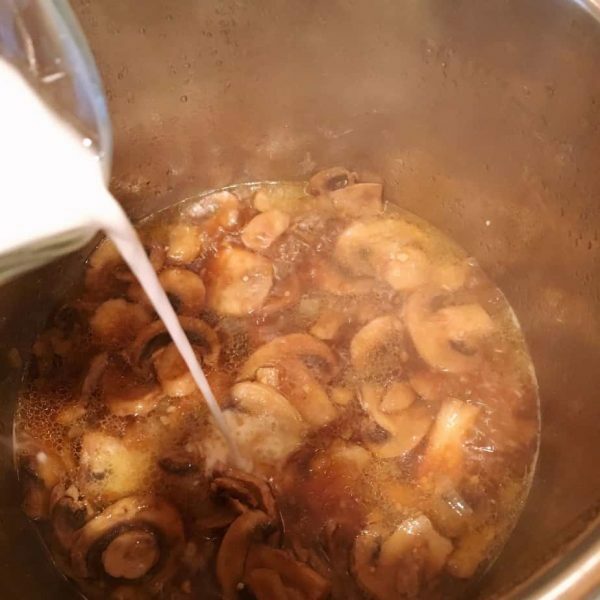 This is loaded with flavor thanks to the mushrooms, beef broth, drippings from those “steaks” and the onions…but it may need a little sprinkle of salt. Turn Instant Pot off and unplug! 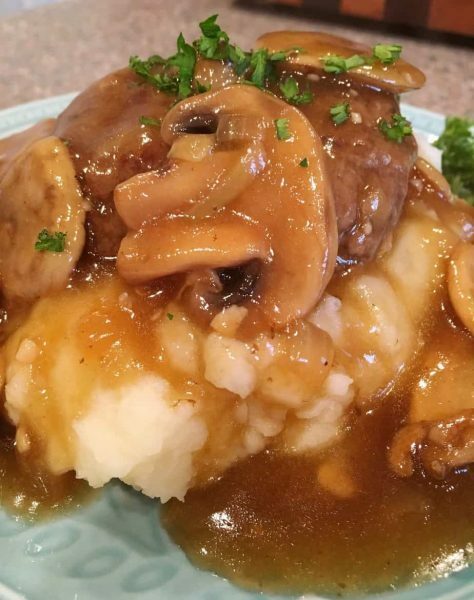 To serve… begin with a heaping scoop of mashed potatoes, top with one of the Salisbury Steaks, ladle that savory mushroom brown gravy over top of Salisbury Steak and mashed potatoes. Just let it run down over the top, mimic the perfect volcanic lava flow! The Salisbury steaks are firm and meaty with the perfect blend of spices and seasonings. Topped with the mushroom gravy it’s truly spectacular! Serve with a side of green beans and green salad and you’ve got a complete dinner in minutes! I love that his main course is made in one pot! 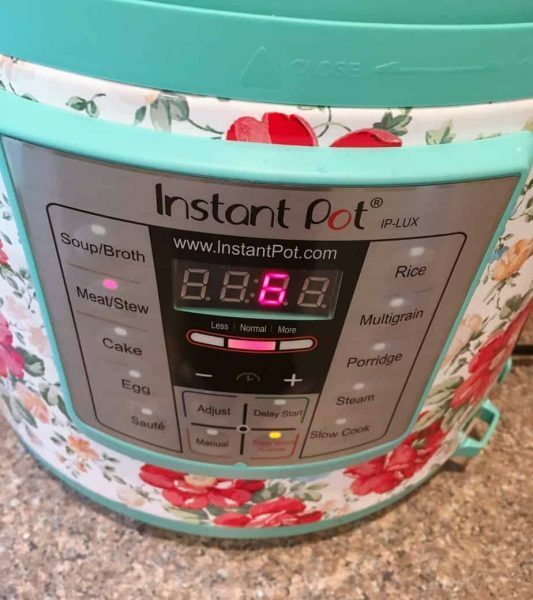 It’s one of my favorite features of the Instant Pot. It’s multiple cooking functions allowing you to cook an entire main course in one pot. This is an AWESOME cooking tool for all you busy Mom’s. I have the 6 quart pot with 16 functions. It’s the perfect size for our Nest! 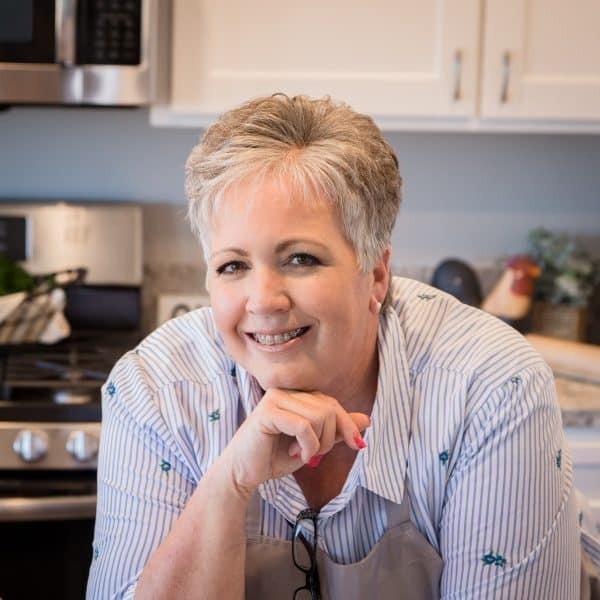 I’m so excited to create more delicious recipes for you to try with your Instant pot. Don’t panic! 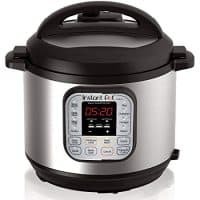 I’m not going 100% Instant Pot on this site…anymore than I’m 100% slow cooker. With that said every recipe can adjusted to work without an instant pot. It will just take more time. This recipe is no exception. If you don’t own an Instant Pot… Sauté your beef patties in a skillet on the stove top until cooked completely through. 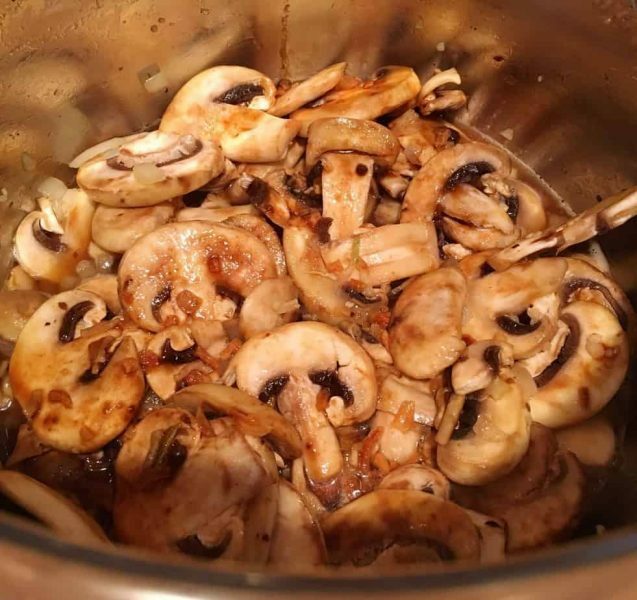 Remove steaks, and add your mushrooms, onions and garlic. Sauté until tender. Add beef broth mixture and bring to a low boil. Add corn starch mixture while stirring, continue to stir until thick and beef broth is clear. I hope you enjoy making this recipe as much as I did creating it! I’m having so much fun with my new toy! I kinda want to kick myself for waiting so long to join the throngs of you who are already living in Instant Pot land! If you haven’t used yours yet…BUST open that box and let’s cook together! Be sure to follow me on Instagram where I’m sharing my cooking explorations with my Instant Pot. I’m sharing this recipe on a few of my very favorite link parties! 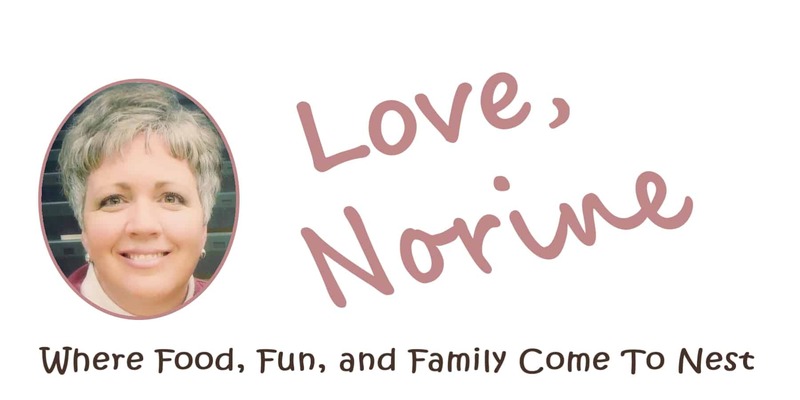 Click the links below to join us for the best recipes on the web! 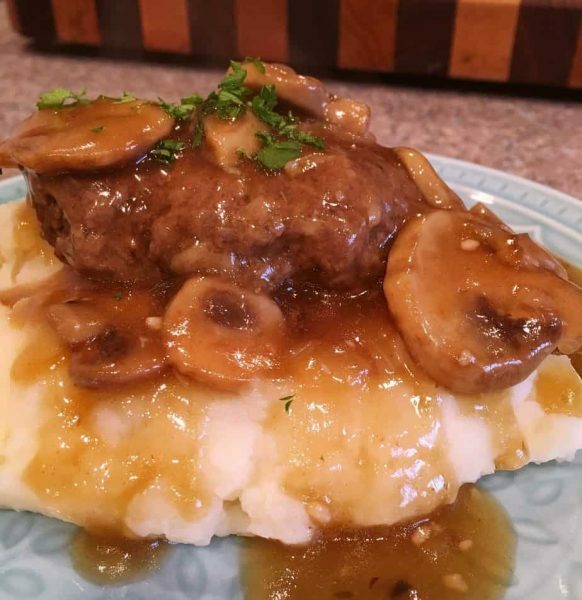 Tender flavorful ground beef is pressure cooked to perfection and topped with an amazing savory mushroom and onion brown gravy served over mashed potatoes. 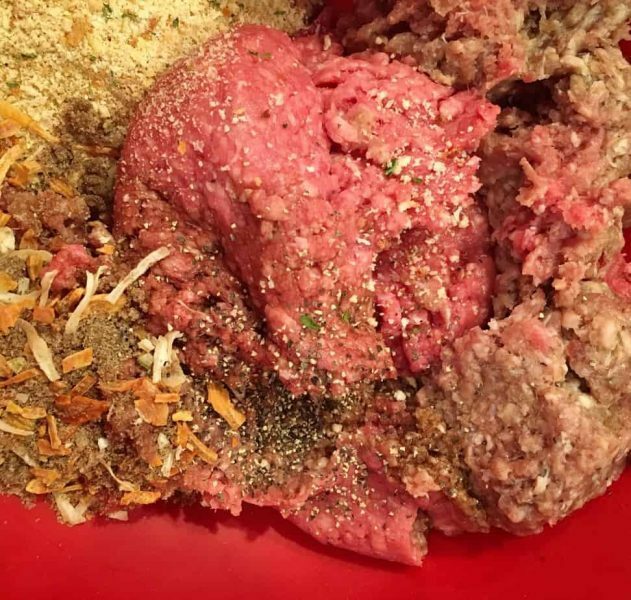 In a large bowl combine hamburger, bread crumbs, dry onion soup mix, black pepper, garlic salt, onion powder, and Worcestershire sauce. Mix well. Divide into 4 equal portions and form into 3/4 inch thick patties. Turn Instant Pot onto "Saute/More" setting. Add Olive Oil. When indicator is "hot" sear steak patties until golden on both sides, but do not cook through. Remove from pot and set aside. Add diced onion, garlic, and mushrooms. Saute until tender and onions are translucent. Mix 1 cup of beef broth with 1 Tablespoon dry onion soup mix. Pour over mushrooms and onions. 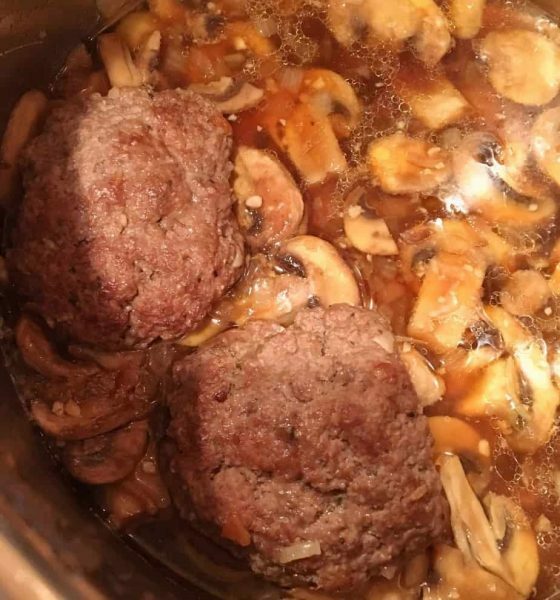 Add steak patties on top of the mushroom mixture. Place pressure lid on top of Instant Pot and lock into "sealed" position. Select "meat/stew" button and set for 6 minutes normal heat. Allow to natural release for 5 minutes. If pressure is still built up then do a "quick release". Wait for float valve to recess. Remove lid. Remove cooked steaks. Cover to keep warm. Reset Instant Pot to "Saute" and bring broth to a simmer. 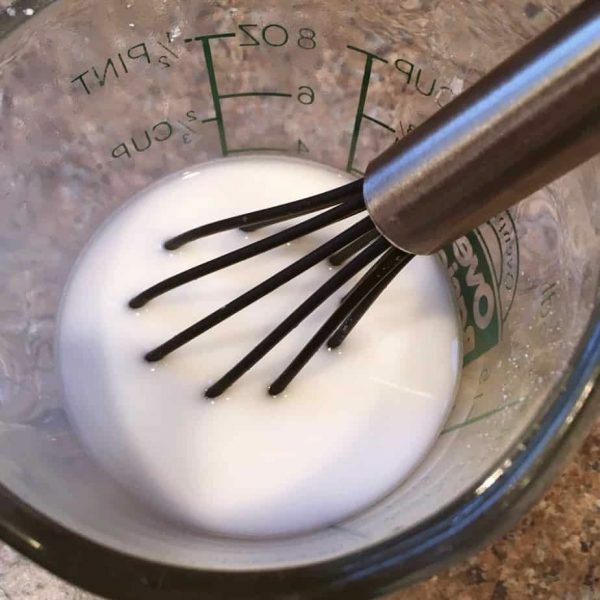 Mix together 1/2 cup water with 3 tablespoons corn starch. Mix well. Slowly pour into simmering mushroom broth mixture. Season with salt and pepper to taste. Stir until thickened and broth is clear. 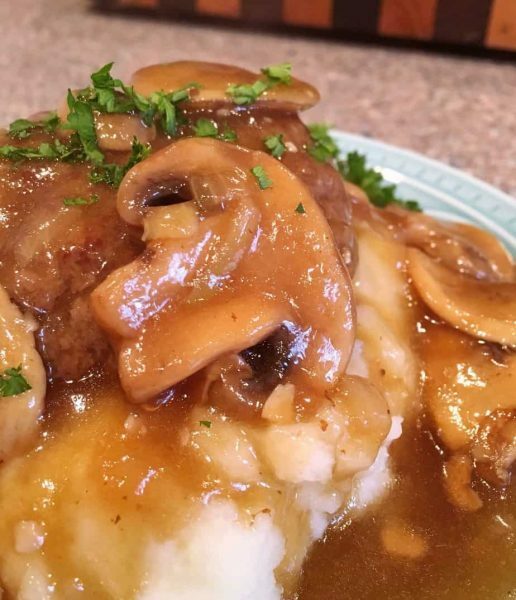 Place Salisbury steak on top of scoop of mashed potatoes and top with a ladel of mushroom brown gravy mixture. Garnish with chopped parsely if desired. You can double this recipe. Layer steak patties on top of each other before pressure cooking. I’m so excited to be amongst all the “pot heads”! lol (I hear that’s what I am now!) I’m super excited to start creating recipes that will work well with the Instant Pot. I can certainly understand having 2 of them! That may be on my agenda next! Thanks for stopping by to visit with me. I look forward to more visits! I still don’t have an Instant Pot and you’re making me really want one now. This looks so delicious! I have to be honest. I am loving mine. I fought it long and hard. You’d love it…there is a learning curve but it’s awesome. Thanks for stopping by. You’re the best.